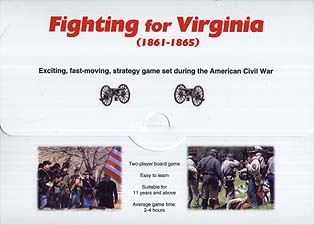 Players take on the roles of Presidents Abe Lincoln and Jeff Davis as their respective blue and grey armies battle it out in the killing-fields of Virginia and neighbouring Stats. Skilfully move your armies around the high quality board depicting the region's salient features. Follow in the footsteps of Generals Robert E Lee, US Grant and Stonewall Jackson as they do battle at such famous towns as: Fredericksburg, Gettysburg, Winchester and Manassas. Can you crush the rebellion and preserve the Union or can you survive to secure the Confederacy's independence? The game takes less than 5 minutes to set up. Players follow a simple "move and fight" process. Players acquire Victory Points by defeating enemy armies capturing enemy towns or fulfilling special tasks. With many strategies possible, and with the fluctuating fortunes of war, each game is different. Access to Optional Rules enables players to easily create new game variants. 1 colour map (24 x 32 squares). Blue and Gray numbered square army pieces. 1 "Let's Get Started" Rules leaflet.